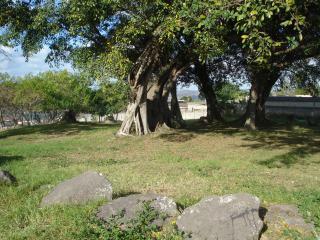 This site is a grove of historic fig trees. Story has it that when the Parks Department came to thin out the grove, a snake appeared in the branches and scared the workers away. On subsequent visits, the snake continued to come out and scare away Municipal workers. By this time elders in the community revealed that the site was the location of a grave of a past Inkosi, or Zulu king. Snakes in Zulu culture are the physical representation of ancestors, and it is believed that the snake is connected to the former Inkosi who continues to guard the site. A grave marker was since put on the site.